Who would have thought that such a small tomato, in such a strange color, could have such fantastic flavor? 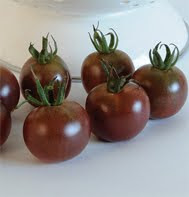 'Black Cherry' cherry tomatoes are sweet and complex, much like full-sized heirloom tomatoes. The color is a dark purplish red, almost black. Because customers aren't accustomed to cherry tomatoes of this color, we recommend that you sell them in a "rainbow mix" of multiple varieties. 'White Cherry', 'Sungold', and 'Favorita' are all approximately the same size and the same 60 days to maturity. Or create your own mixture, with many shapes, sizes, and colors. Encourage people to conduct their own taste tests. We bet 'Black Cherry' will soon be a customer favorite. 'Black Cherry' is an indeterminate variety that should be staked. Johnny's has the supplies you need, including tomato twine, clips and Ty'mup tapeners and tape. 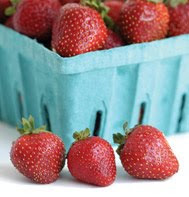 Here's a new idea for early-season sales: A strawberry plant that fruits in 50 days in a hanging basket -- the perfect Mother's Day gift! Order 'Seascape' Mother's Day Sales and your plants will arrive in early March. Plant them right away in hanging baskets in the greenhouse and you'll have baskets overflowing with blossoms and fruits by early May. 'Seascape' (right) is also available for shipping at a later date if you plan to plant in the field. This day-neutral variety yields well, and berries are large and flavorful. 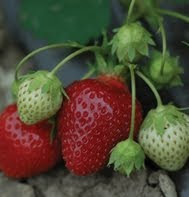 For organic growers, we also have certified-organic 'Albion' strawberry plants. 'Albion' (left) has good resistance to verticillium wilt and phytophthora crown rot, with some resistance to anthracnose crown rot. It yields well all season, with large, firm, uniform fruits. This is a great variety to grow in the hoophouse. Rhubarb is another crop that can round out your organic market offerings early in the season. It is a hardy perennial that produces for six to eight weeks a year and lives for 15 years or longer in the right spot. The tender, rosy-red stalks of the variety 'Victoria' are sweeter and milder than other varieties, and perfect for making pies and jams. Rhubarb crowns should be planted in early spring in well-drained, fertile soil, in full sun. Crowns should be spaced 3' apart in the row, and 5' between rows. It should not be harvested the first year, and only a few stalks per plant should be taken the second year. 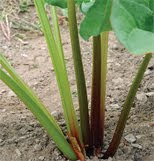 After that, all stalks 1" or more in diameter can be cut without harming the plant. Order rhubarb crowns now and they will be shipped at the appropriate planting date for your location in late March through late April. If you sell plants, set yours apart from the competition with DOT Pots™, which are 100% organic and OMRI-listed. The pots are biodegradable, so they can be planted right in the soil. Your customers will appreciate that they are environmentally responsible as well as easy to plant. 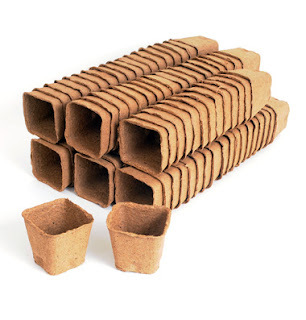 DOT Pots™ are made using only two ingredients: 80% wood fiber and 20% peat moss. Binding is achieved through a patented technology. DOT Pots™ are available in strips, square pots, or round pots. There's a size for every kind of plant you sell. This will help you guide through some of the easy ways by which you may get an assignment help and also include My assignment help review. First of all, you can ask for guidance from the teachers and the instructors for help and explain your issues. You can also get help from your peers or seniors while writing an assignment. Myassignment will help that students decide on whether the service is worth the price and the aspects that the student should consider while selecting an assignment help services online.